Context: The establishment of appropriate working length is one of the most critical steps in endodontic therapy. Electronic apex locators have been introduced to determine the working length. The development of electronic apex locators has helped make the assessment of the working length more accurate and predictable, along with reduction in treatment time and radiation dose. Objectives: The aim of this study was to compare the efficacy of electronic apex locators after cleansing and shaping of the root canals and whether there was any alteration in accuracy when used in the presence of irrigants. 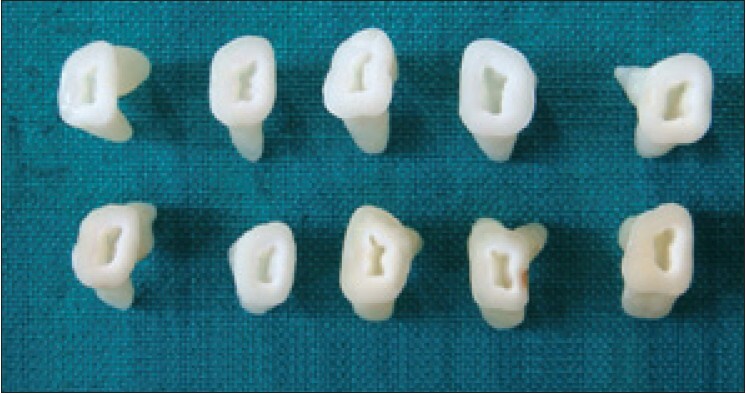 Materials and Methods: Seventy extracted human permanent molars with mature apices were selected. Equal number of maxillary and mandibular permanent molars (35 each) were sectioned at the cemento-enamel junction. Access opening was done and only the mesiobuccal root canal was studied for the purpose of standardization. Electronic working length measurements were taken before and after preparation of the mesiobuccal canal with Root ZX and ProPex II using various irrigants. Statistical Analysis Used: The data were statistically analyzed using a paired t-test at 0.05 level of significance. Results: P-values for actual and final canal lengths for Root ZX employing NaoCl(0.001), CHX(0.006), LA(0.020) and for ProPex II was (0.001) respectively. When the data were compared, results were statistically significant (P < 0.05). Conclusion: Within the limitations of this study Root ZX can be considered to be an accurate electronic apex locator and CHX as irrigant matched more precisely with the actual canal length measurements. Context: Mixed dentition arch analysis system is an important criterion in determining the type of orthodontic treatment plan. Different mixed dentition arch analysis system are available and among them both Moyer's and Tanaka-Jhonson method of space analysis was developed for North American children. Anthropological study reveals that tooth size varies among different ethnicities The present study was performed to determine the reliability of Moyer's and Tanaka-Jhonson's method of mixed dentition arch analysis system among Bengali population. 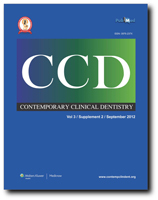 Aims: To perform the comparative evaluation of the two mixed dentition space analysis system among Bengali population. Materials and Methods: Dental casts of maxillary and mandibular arches of 70 Bengali children with permanent dentitions were fabricated. The mesiodistal crown dimensions of all erupted permanent incisors, canines, and premolars were measured with digital callipers. For particular sum of mandibular incisors, Moyer's and Tanaka-Jhonson's mixed dentition arch analysis were calculated and further statistical analysis was carried on. Statistical analysis used: Descriptive statistics including the mean, standard deviation, and minimum and maximum values, unpaired't' tests, correlation coefficient "r" were calculated and tabulated. Results: Tanaka and Johnston regression equations under-estimated the mesiodistal widths of permanent canines and premolars. On the other hand, there were no statistically significant differences between actual mesiodistal widths of canines and premolars and the predicted widths from Moyers charts at the 50% level for the lower and upper arches, among Bengali population. Conclusions: The study suggested that both Moyer's and Tanaka-Jhonson's mixed dentition arch analysis are applicable in Bengali population but with little modification in their regression equation. Introduction : Successful root canal treatment depends primarily on the removal of micro-organisms through chemo-mechanical instrumentation of the root canal system. This encompasses shaping by mechanical removal of the dentine and cleaning by chemical disinfection of microorganisms and dissolution of organic tissues from the root canal. While root canal shaping can be predictably and efficiently attained with advanced instrumentation technology, effective cleaning of the entire root canal system remains a challenge. Rotary nickel titanium instruments are known for their efficient preparation of root canal. This is mainly because of the super elasticity of the nickel titanium alloy which gives an increased flexibility and allows the instrument to efficiently follow the original path of root canal. The purpose of this study is to compare the cleaning efficiency and shaping ability of M two, K3, Race ni-ti rotary instruments during the preparation of curved canals in extracted molars. Materials and Methods : Thirty teeth with 18 mm as their working length were selected and divided into three groups of 10 teeth each Angle of curvature, Radius of curvature, was determined using computerized tomography. A Pre and Post-operative measurement of canal width and volume was recorded and compared using CT. The teeth was then sectioned into two halves and subjected to scanning electron microscope. Images were taken at the level of apical third, middle third and coronal third for debris and smear layer. 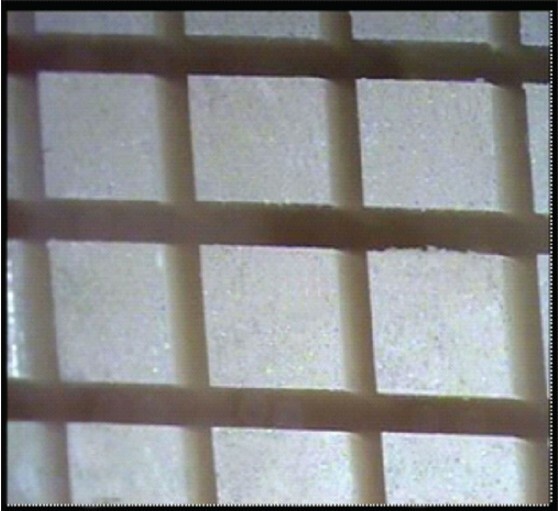 Scoring was done separately for both debris and smear layer. Results : Results were tabulated and statistically analyzed to evaluate the shaping ability and cleaning efficiency. Instruments were examined for any deformation or fracture during canal preparation. Conclusion : M two showed greater enlargements in all the three levels, when compared its width and volume, with other two instruments. K3 was better than Race when compared among them. In the scanning electron microscope study for debris and smear layer M Two performed better followed by K3 and Race. Aim: The aim was to evaluate the quantitative changes in nuclear diameter (ND), cytoplasmic diameter (CD) and nuclear/cytoplasmic ratio (N/C) in cytological buccal smears of iron deficiency anemic patients by comparing with normal healthy individuals. Materials and Methods: The study group consisted of 40 healthy individuals and 40 iron deficiency anemic patients who were selected on clinical history, hematological investigations, and confirmed by serum ferritin levels. 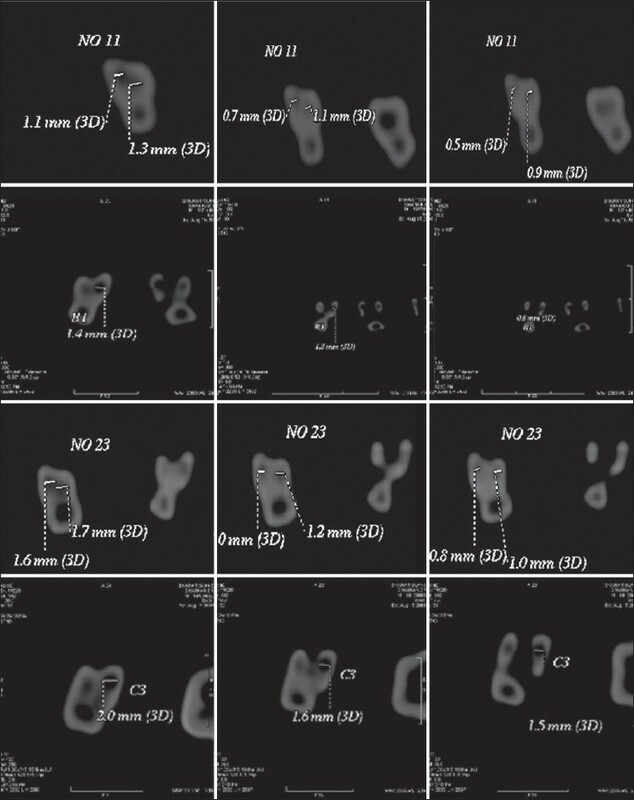 Exfoliative buccal smears stained with PAP stain were evaluated for cytoplasimic, nuclear diameters, and nuclear/cytoplasmic ratios (N/C) using Image Proexpress Version 6.0 image analysis system. All the parameters were statistically analyzed by using unpaired 't' test. Results: A significant increase is seen in the average nuclear diameter (ND) and N/C ratio of the anemic group when compared to the control group. The average cytoplasmic diameter (CD) did not show any statistical difference among the two groups. Conclusion: Oral exfoliative cytological techniques could possibly be a noninvasive alternative diagnostic tool for iron deficiency anemia. Aim: The aim was to evaluate and compare the efficacy of ProTaper Universal rotary retreatment system with or without solvent and stainless steel hand files for endodontic filling removal from root canals and also to compare retreatment time for each system. 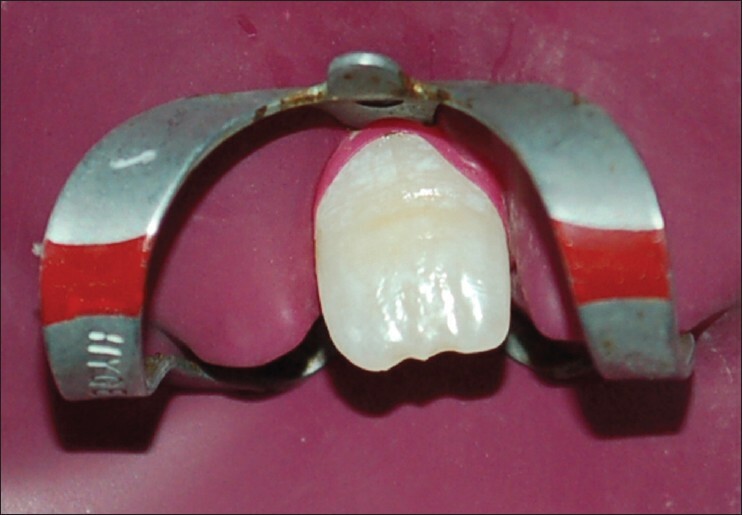 Materials and Methods: Thirty extracted mandibular premolars with single straight canals were endodontically treated. Teeth were divided into three major groups, having 10 specimens each. Removal of obturating material in group 1 by stainless steel hand files with RC Solve, group 2 by ProTaper Universal retreatment instruments and group 3 by ProTaper Universal retreatment instruments along with RC solve was done. Retreatment was considered complete for all groups when no filling material was observed on the instruments. The retreatment time was recorded for each tooth. All specimens were grooved longitudinally in a buccolingual direction. The split halves were examined under a stereomicroscope and images were captured and analyzed. The remaining filling debris area ratios were considered for statistical analysis. Results: With ANOVA test, statistical analysis showed that there was statistically no significant difference regarding the amount of filling remnants between the groups (P < 0.05). Differences between the means of groups are statistically significant regarding the retreatment time. Conclusion: Irrespective of the technique used, all the specimens had some remnants on the root canal wall. ProTaper Universal retreatment system files alone proved to be faster than the other experimental groups. Background: The availability of oral health services are very scarce in rural India; therefore the unmet treatment needs of rural population are very high. Hence, a retrospective study was conducted to evaluate the types of patients, disease pattern, and services rendered in outreach programs in rural areas of Haryana. Materials and Methods: A The data were obtained from records of outreach programs conducted, in last 3 months, by Swami Devi Dyal Hospital and Dental College. The data from were analyzed using descriptive statistics. Results: A total of 1371 individuals in the age group of 4--70 years (56.8% males and 43.2% females) attended the outreach program seeking the treatment. Dental caries (43.7%), gingivitis (27.2%), and periodontitis (22.9%) were commonly observed dental diseases. The services provided were oral prophylaxis (51.2%), restoration (22.9%), referral (20%), and extractions (8.8%). Conclusion: The attendance and utilization of dental services in the out reach programs seem to be influenced by sociodemographic characteristics of the population. Objectives: The objective of this in vitro study was to compare the microtensile dentin bond strength (μTBS) of five seventh-generation dentin bonding agents (DBA) with fifth-generation DBA before and after thermocycling. Materials and Methods: Ten extracted teeth were assigned to fifth generation control group (optibond solo) and each of the five experimental groups namely, Group I (G-Bond) ,Group II (S 3 Clearfil), Group III (One Coat 7.0), Group IV (Xeno V), and Group V (Optibond all in one). The crown portions of the teeth were horizontally sectioned below the central groove to expose the dentin. 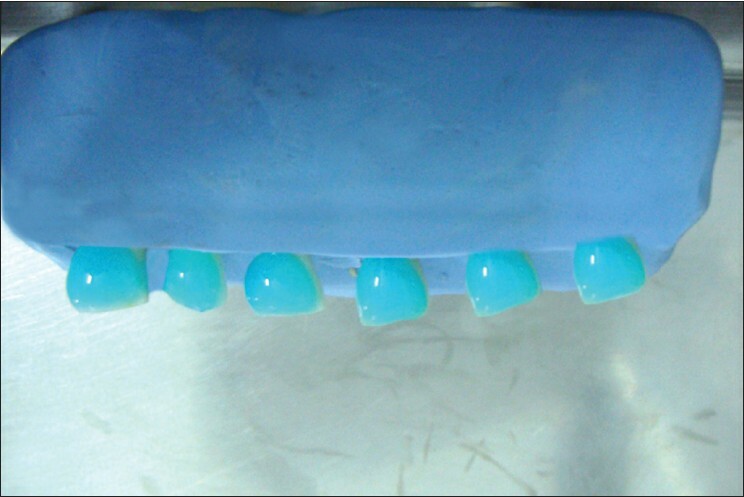 The adhesive resins from all groups were bonded to the teeth with their respective composites. Specimens of sizes 1 × 1 × 6 mm 3 were obtained. Fifty specimens that bonded to dentin from each group were selected. Twenty-five of the specimens were tested for debonding without thermocycling and the remaining were subjected to thermocycling followed by μTBS testing. 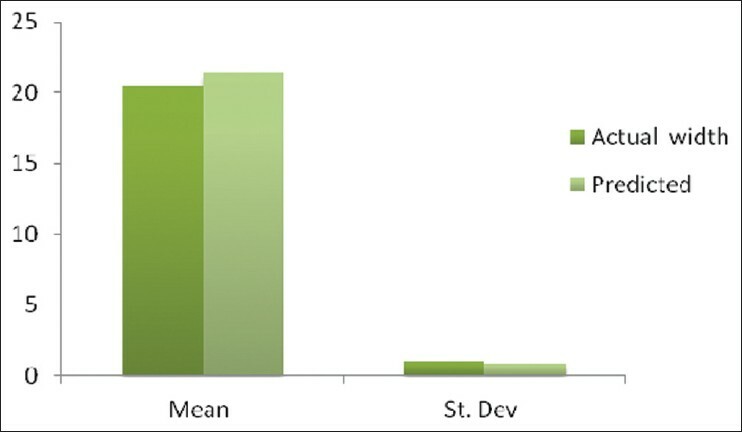 The data were analyzed with one-way ANOVA and Dunnett's-test for comparison with the reference group(Vth Generation). Results: There was no significant difference (P > 0.05) between the fifth- and seventh-generation adhesives before and after thermocycling. The results of our study showed significantly higher value (P < 0.05) of μTBS of seventh-generation Group II (Clearfil S 3 ) compared to the fifth-generation before and after thermocycling. Conclusion: The study demonstrated that the Clearfil S 3 bond had the highest μTBS values. In addition, of the five tested seventh-generation adhesive resins were comparable to the fifth-generation DBA. Aim : The aim of this ex vivo study was to evaluate the effect of in-office bleaching agents,-35% and 38% hydrogen peroxide containing bleaching agents, on the phosphate concentration of the enamel evaluated by Raman spectroscopy. Materials and Methods : Forty noncarious, craze-free human maxillary incisors, extracted for periodontal reasons, were used in this study. Baseline Raman spectra from each specimen were obtained before the application of the bleaching agent to assess the phosphate content present in the teeth. The teeth were divided into two groups: Group A - bleached with pola office bleach (35% hydrogen peroxide, potassium nitrate) (light activated). Group B - bleached with opalescence Xtra bleach (38% hydrogen peroxide potassium nitrate and fluoride) (chemical activated). After the bleaching procedure, the treated specimens were taken to obtain Raman spectra to assess the phosphate loss after bleaching treatment. Results : The results showed that the chemically activated bleaching agent showed less phosphate loss when compared with the light activated bleaching agent. Conclusion : Within the limitations of this study, it can be concluded that the chemically activated bleaching agent showed minimal phosphate loss when compared to light activated bleaching agent. The chemically activated bleaching agent was better than the light activated bleaching agent when values were evaluated statistically. The major challenge of performing root canal treatment in an open apex pulp-less tooth is to obtain a good apical seal. MTA has been successfully used to achieve a good apical seal, wherein the root canal obturation can be done immediately. MTA and White Portland Cement has been shown similarity in their physical, chemical and biological properties and has also shown similar outcome when used in animal studies and human trials. In our study, open apex of three non vital upper central incisors has been plugged using modified white Portland cement. 3 to 6 months follow up revealed absence of clinical symptoms and disappearance of peri-apical rarefactions. The positive clinical outcome may encourage the future use of white Portland cement as an apical plug material in case of non vital open apex tooth as much cheaper substitute of MTA. Plasma cell gingivitis is an uncommon inflammatory condition of uncertain etiology often flavoured chewing gum, spices, foods, candies, or dentifrices. The diagnosis of plasma cell gingivitis is based on comprehensive history taking, clinical examination, and appropriate diagnostic tests. Here we are presenting a rare case of plasma cell gingivitis caused by consumption of colocasia (arbi) leaves. Colocasia is a kind of vegetable, very commonly consumed in the regions of North India. Sialoliths are the most common diseases of the salivary glands. They may occur in any of the salivary gland ducts but are most common in Wharton's duct and the submandibular gland. This report presents clinical and radio graphical signs of two unusually large sialoliths which exfoliated by itself. There were painless swellings on the floor of the mouth in both cases. 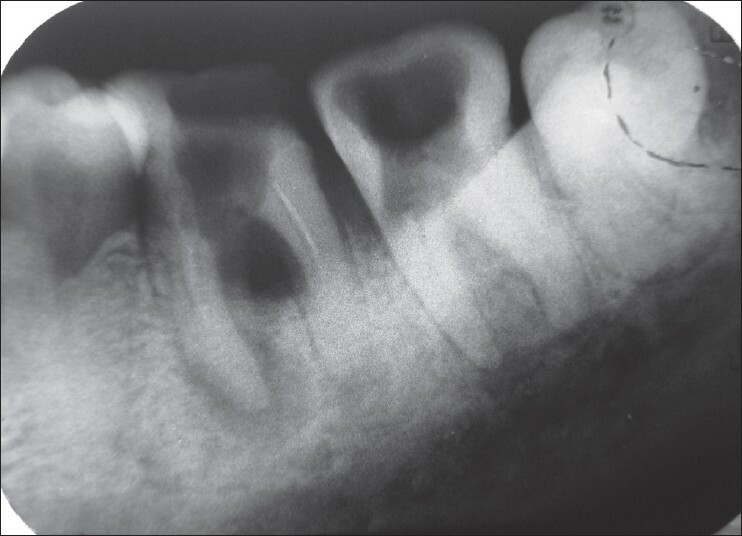 Radiographical examination revealed large irregular radioopaque mass superimposed right canine and premolar areas. Sialoliths were yellow in color and approximately 1.8 cm and 2.1 cm in size. Oligodontia is one of the most common developmental abnormalities in humans. 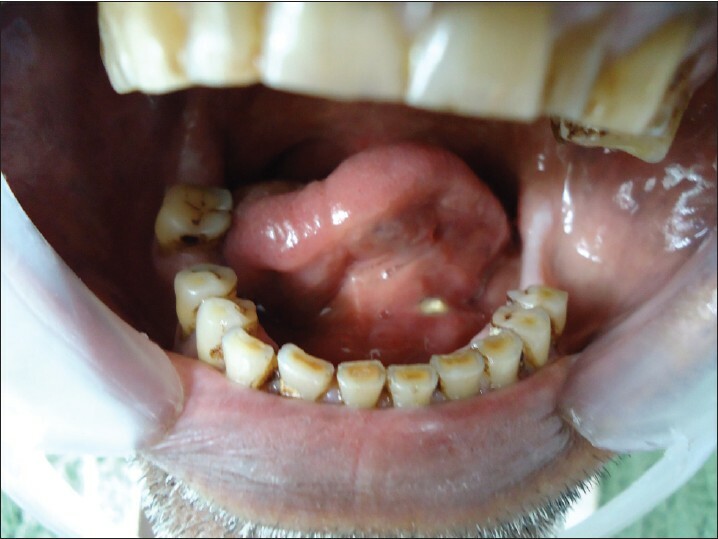 The present case report highlights the features of oligodontia in a 12-year-old male patient which was managed successfully with multidisciplinary approach. Familial oligodontia represents as an absence of varying numbers of secondary teeth seen as an isolated trait. The advance in the understanding of tooth development and genetic control of tooth morphology not only allows clinical research to broaden the knowledge of tooth agenesis but also provides optimum clinical care. 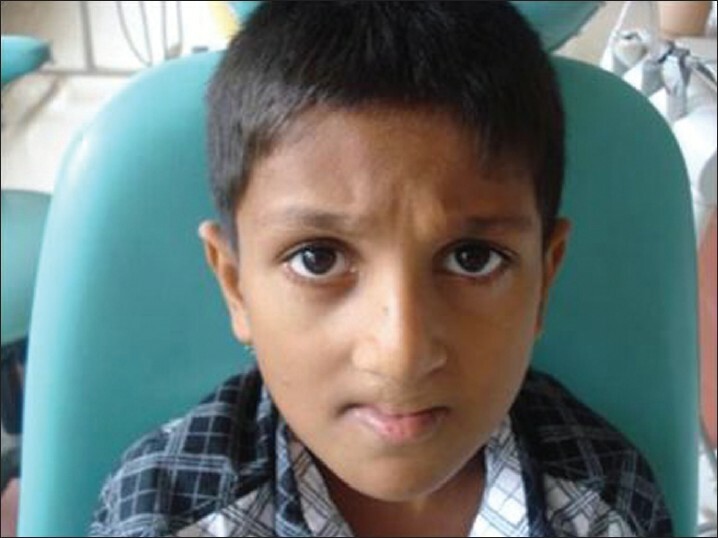 One of the most common developmental defects seen in south India is cleft lip and palate. Among them a few are associated with lip pits and termed as Vander Woude's syndrome. The early diagnosis of this rare syndrome is very necessary followed by a multidisciplinary approach. It is also necessary to differentiate this syndrome from the other syndromes which may present similar features. A case report of the same is presented here requiring a multidisciplinary approach for a functional and esthetically pleasing outcome. The development of adhesive dentistry has allowed dentists to use the patient's own fragment to restore the fractured tooth, which is considered to be the most conservative method of treatment of crown fracture allowing restoration of original dental anatomy, thus rehabilitating function and esthetics in a short time by preserving dental tissues. The tooth fragment reattachment is preferred over full coverage crowns or composite resin restoration because it conserves sound tooth structure, and is more esthetic, maintaining the original anatomy and translucency, and the rate of incisal wear also matches that of original tooth structure. Presented here is a report of two cases of crown fracture managed by reattachment procedures. 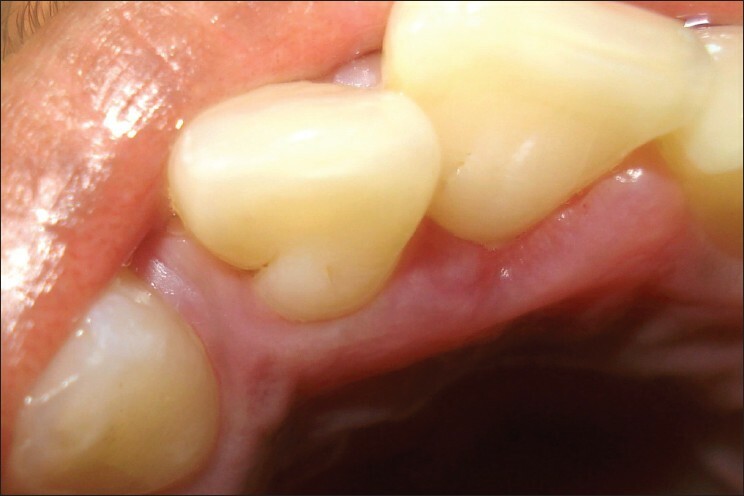 The earliest evidence of demineralization on the smooth enamel surface of a crown is a white spot lesion. The conventional treatment of these white spot lesions includes topical fluoride application, iamproving the oral hygiene, and use of remineralizing agents. The following article illustrates the use of a novel approach to treat smooth surface noncavitated white spot lesions microinvasively based on infiltration of enamel caries with low-viscosity light curing resins called infiltrants. This treatment aims upon both the prevention of caries progression and improving esthetics, by diminishing the opacity. Solitary median maxillary central incisor (SMMCI) is a unique developmental anomaly in primary dentition. It involves central incisor tooth germs and may or may not be associated with other anomalies. Its presence, concomitant with fusion of right mandibular incisors has not previously been reported. A 5-year-old girl was presented with a single symmetrical primary maxillary incisor at the midline, with the absence of labial frenulum, an indistinct philtrum and a prominent midpalatal ridge. There was an associated fused tooth in the right incisor region and radiographic examination confirmed only one maxillary central incisor in both the dentitions. 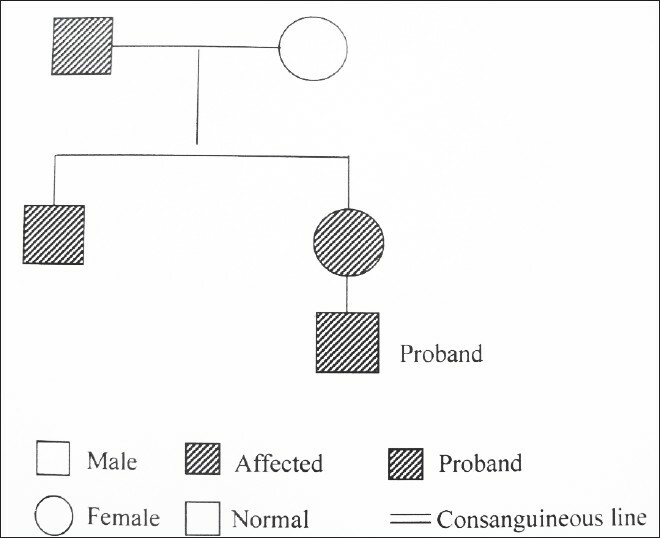 Family history revealed that the father of the girl also had a similar anomaly providing probable evidence of etiological role for heredity in SMMCI. 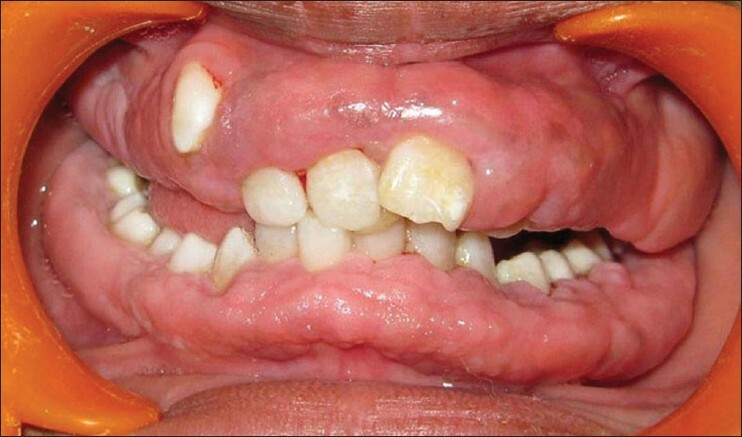 Gingival fibromatosis is a benign oral condition characterized by enlargement of gingival tissues. It usually develops as an isolated disorder but can be one of the features of a syndrome. 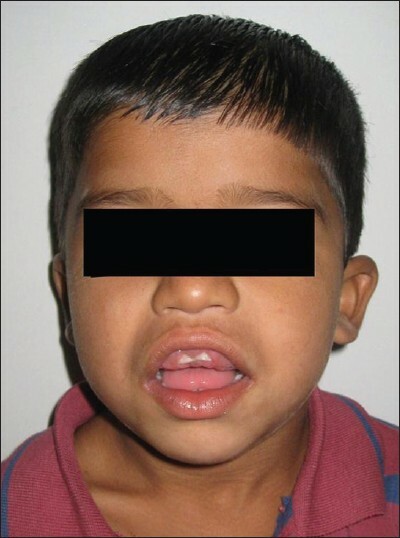 This case report is of a 5-year-old male with severe gingival hyperplasia and mild mental retardation which was complicated by open bite, abnormal occlusion, open lip posture, and disabilities associated with mastication and speech. Full mouth gingivectomy in single sitting under general anesthesia was done with electrocautery. 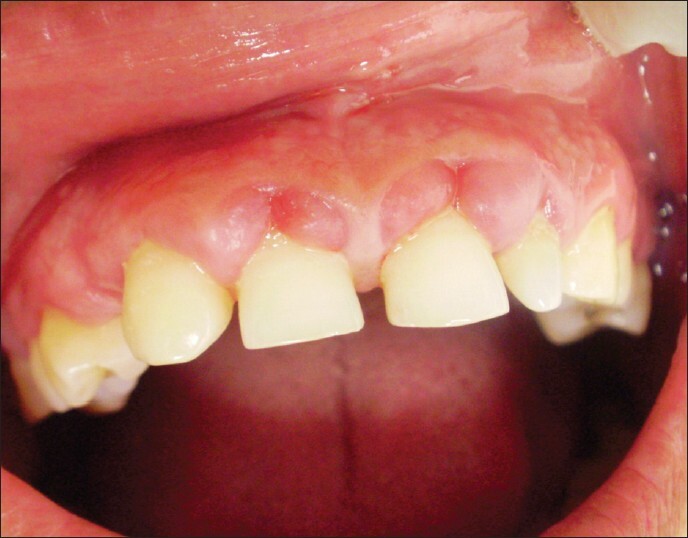 Hereditary gingival fibromatosis is a rare condition characterized by various degree of gingival overgrowth. It usually develops as an isolated disorder but can manifest with multisystem syndrome. We are here presenting a case of a 13-year-old girl who presented with severe enlargement of gingiva covering all most the entire crown involving both maxillary and mandibular arches. Differential diagnosis includes drug-induced and idiopathic gingival enlargement. Excess gingival tissue was removed by full mouth gingivectomy and sent for histopathological examination. Postoperative course was uneventful and patient's esthetics improved significantly. A 12 month postoperative period shows no recurrence. Oral focal mucinosis (OFM), an oral counterpart of cutaneous focal mucinosis, is a rare disease of unknown etiology. 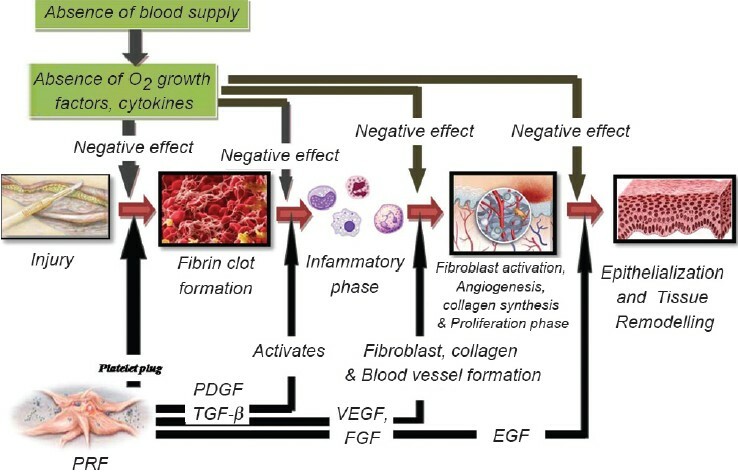 Its pathogenesis may be due to the overproduction of hyaluronic acid by a fibroblast, at the expense of collagen production, resulting in focal myxoid degeneration of the connective tissue, primarily affecting the mucosa overlying the bone. It has no distinctive clinical features, as the diagnosis is solely based on the histopathological features. 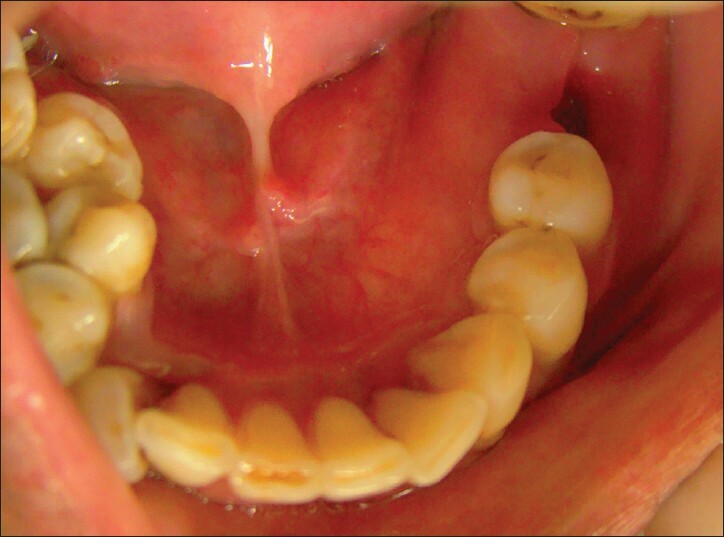 This article reports of a 32-year-old female having the rare disease of oral focal mucinosis, involving the posterior palatal mucosa, and discusses its clinicopathological features and differential diagnosis of myxomatous lesions of the oral cavity. Implant placement in maxillary anterior region has most aesthetic challenges in implant dentistry because tooth loss lead to bone resorption and collapse of gingival architecture, which lead to aesthetic compromise and inadequate bone for implant placement. Immediate implant placement into fresh extraction socket reduces the treatment time, cost, preserved the gingival aesthetic and increases the comfort of the patient. This article describes the procedure for immediate implant placement in fresh extraction socket and early loading of implant with zirconia crown. Clinical and radiographic examination revealed width and length of the tooth for selecting implant size and design. Cement retained zirconia crown was used for early loading. Implant was successfully loaded and was functional during 36 months follow up period. Immediate placement and early loading of dental implant provides advantages like fewer surgical procedures, shorter treatment time, and improved aesthetic and psychological confidence. Cysticercosis is caused by the larvae of the pig tapeworm, Tenia solium. 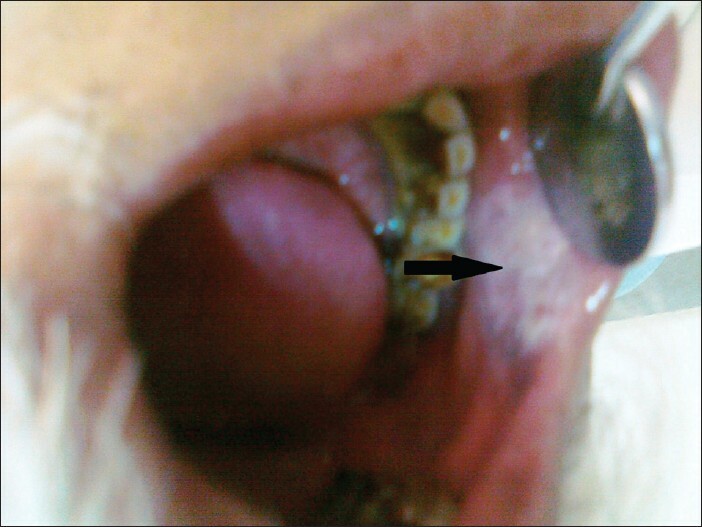 Oral cysticercosis is a rare event and is often a diagnostic challenge to the clinician. We report a 12-year-old girl who presented with a single, painless, nodule on the lower lip that was diagnosed as cysticercosis. Current literature on the clinical presentations, investigations, and treatment of the condition has been reviewed in this article. We have also proposed a set of criteria for the diagnosis of oral cysticercosis. 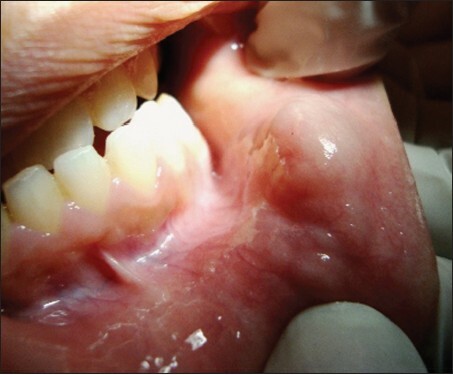 Ameloblastoma is the most common tumor of odontogenic origin. There are various types of this tumor and confusion still exists among the clinicians about the correct classification. Multicystic ameloblastoma is the most frequent subtype while unicystic ameloblastoma can be considered as a variant of the solid or multycistic. This subtype is considered as a less aggressive tumor with a variable recurrence rate. However, its frequency is often underestimated. The aim of this article is reviewing the recent literature about unicystic ameloblastoma using our unusual clinical case as a starting point to illustrate this discussion. A 30-year-old man who had been complaining of slight pain in the premolar and molar area of the left side of mandible had a check up at our department. X-rays revealed a unilocular radiotrasparency with radiopaque margins. The first histological diagnosis was an odontogenic cyst. 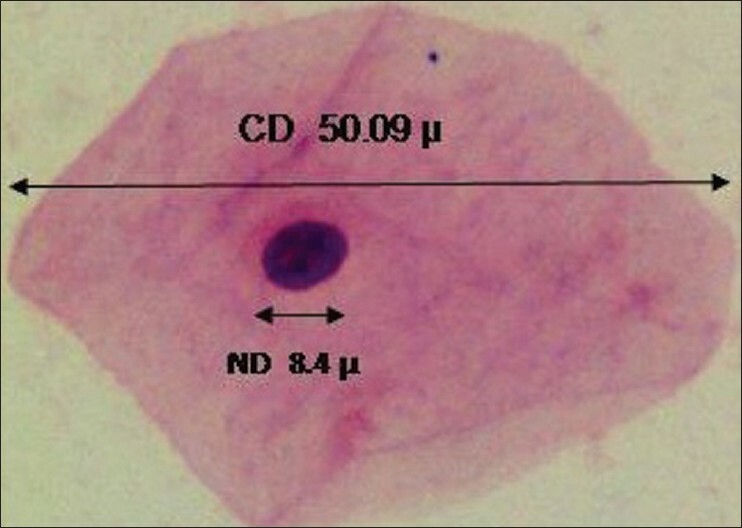 Successive histological evaluations revealed that ameloblastic epithelial islands were present in lassus connective tissue. We think that our case report provides new insights into the approach to the ameloblastoma diagnosis. We agree with authors who have pointed out that a single small biopsy may often be inadequate for the correct diagnosis of amelobastoma. Moreover, in the light of our experience, it should be kept in mind that ameloblastomas may have sometimes unusual presentations and this fact should induce surgeons and pathologists to consider carefully each lesion. Platelet-rich fibrin has long been used as a wound healing therapy in skin wounds and recently evidence has suggested its usage in oral cavity for different treatment procedures. This article proposes an overview of use of platelet-rich fibrin in management of complicated oral wounds. Excessive hemorrhage of the donor area, necrosis of epithelium, and morbidity associated with donor site have been described as the possible complications after harvesting subepithelial connective tissue graft, but little has been mentioned about their management. The article includes a case report of a 45-year-old male patient who showed a delayed wound healing after subepithelial connective tissue graft harvestation, which was treated with platelet-rich fibrin. Adenomatoid odontogenic tumor (AOT) is a benign lesion derived from the complex system of dental lamina or its remnant. It is categorized into three variants (follicular, extrafollicular, and peripheral). We present a rare case of AOT arising from a dentigerous cyst around the unerupted canine in a 28-year-old female. We believe that this case z an odontogenic cyst with neoplastic development, containing both epithelial and mesenchymal components. As more cases accumulate, we will be able to study these rare lesions further whether the AOTs derived from an odontogenic cyst could represent a distinct "hybrid" variant separate to the three variants described thus far. 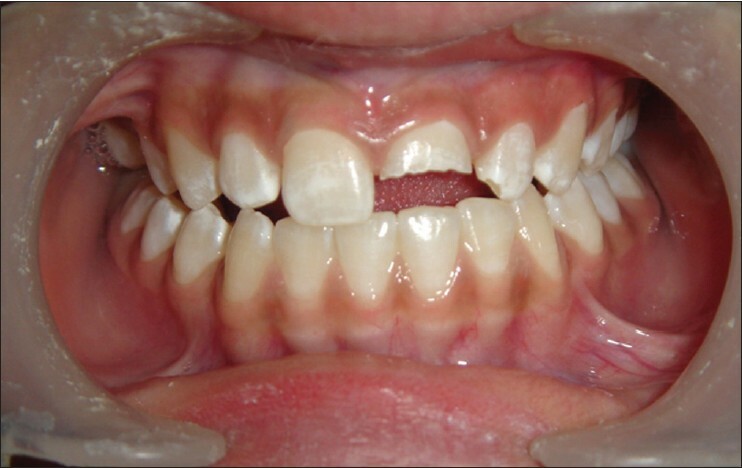 Multiple supernumerary teeth are very rare, accounting for less than 1% of cases. They are commonly associated with syndromes like Gardner's syndrome and cleidocranial dysostosis and cleft lip and palate. 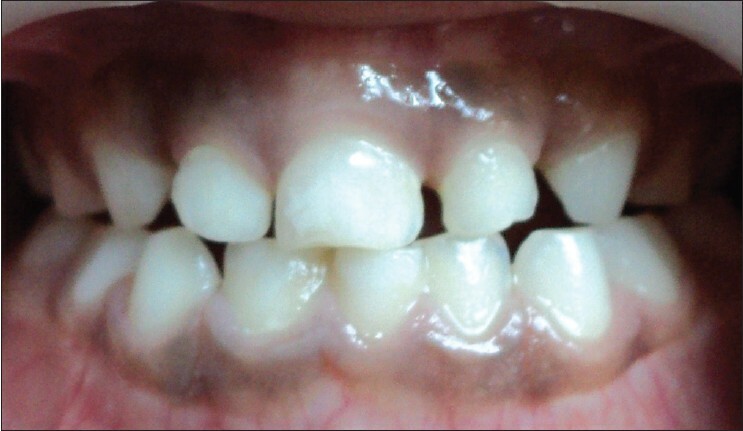 Non-syndromic multiple supernumerary teeth have a predilection to occur in the mandibular premolar region. Orthokeratinized odontogenic cyst (OOC) is a relatively uncommon developmental cyst comprising about 10% of the cases that had been previously implied as odontogenic keratocysts. 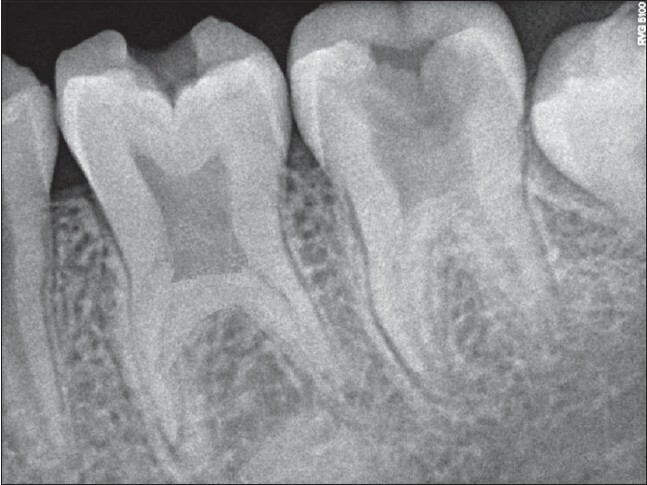 More than half of the cases of OOC are associated with impacted tooth; but not a single case of OOC associated with supernumerary teeth is reported. Hence, the purpose of this article is to report the first case of multiple supernumerary mandibular premolars associated with OOC in a 35-year-old male and to review the literature associated with multiple bilateral supernumerary mandibular premolars. Taurodontism is a morphoanatomical developmental anomaly rarely seen in teeth. Permanent mandibular molars are most commonly affected. Endodontic treatment of a taurodont tooth is challenging and requires special handling because of proximity and apical displacement of roots. This paper presents a successful endodontic therapy of all three types of taurodonism with two case reports - the first case with mesotaurodontism of mandibular left first molar and hypotaurodontism of mandibular left second molar and the second case with hyper taurodontism of mandibular left second molar. Verruciformxanthoma (VX) is an uncommon benign mucocutaneous lesion of unknown etiology. It appears as a papule or single plaque with verrucous or papillomatous surface and variable color from reddish pink to gray. It occurs primarily in the masticatory mucosa. Histologically, VX is characterized by the presence of parakeratinized epithelium with thin rete ridges and connective tissue papillae extending up to the surface. 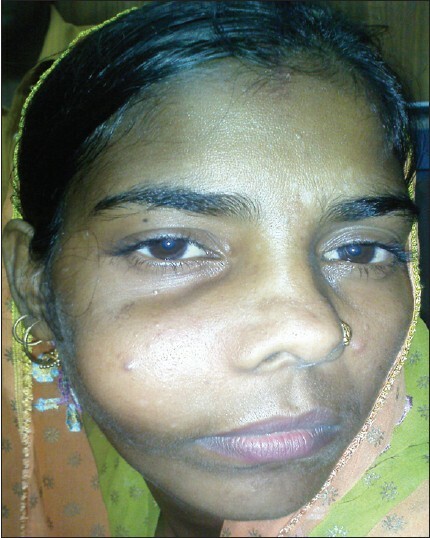 The papillae characteristically consist of foam cells, also called xanthoma cells. 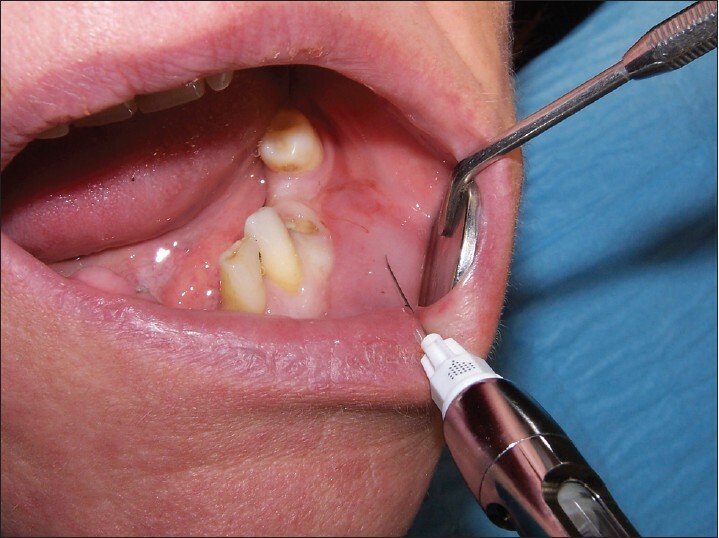 We report a case of VX in the buccal mucosa and discuss their clinical and histopathological findings. Various root developmental anomalies like palatoradicular groove (PRG) have been associated with worsening of periodontal condition. The aim of the present case report is to describe the regenerative surgical treatment of periodontal and osseous lesion associated with the subgingival extension of PRG. A 23-year-old female patient reported with pain in upper incisor teeth region. On clinical and radiological examination, a deep endosseous defect was found distal to maxillary right lateral incisor that was etiologically associated with the presence of a PRG. Treatment procedures consisted of: Regenerative periodontal therapy using Guided tissue regeneration (GTR) and hydroxyapatite (HA) bone graft and 2) flattening of the radicular portion of the palatal groove. The clinical examination at 1 year revealed shallow residual probing depth (3 mm) and no increase in gingival recession. The radiographic examination showed reduction in the radiolucency suggesting bone fill. 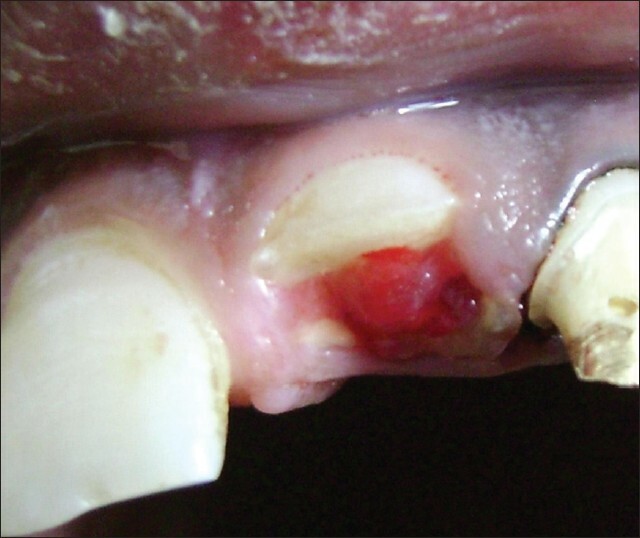 A PRG may serve as a pathway for the development of a periodontal osseous defect. The combination of GTR and HA may be clinically and radiographically efficacious in the treatment of such a defect. Conventional root canal treatment (RCT) of the teeth has long shown high success rate. However, the endodontic treatment of a pulpless tooth with periapical radiolucency of a considerable size always has a question of success. In modern days, surgical exploration is avoided, especially in the posterior teeth. These types of cases may be successfully managed by orthograde Mineral Trioxide Aggregate (MTA) placement in the apical third of the root followed by proper obturation. The objective of our present case reports was to evaluate the periapical pathology of posterior teeth clinically and radiographically by using MTA in orthograde way and avoiding traumatic surgical exploration. 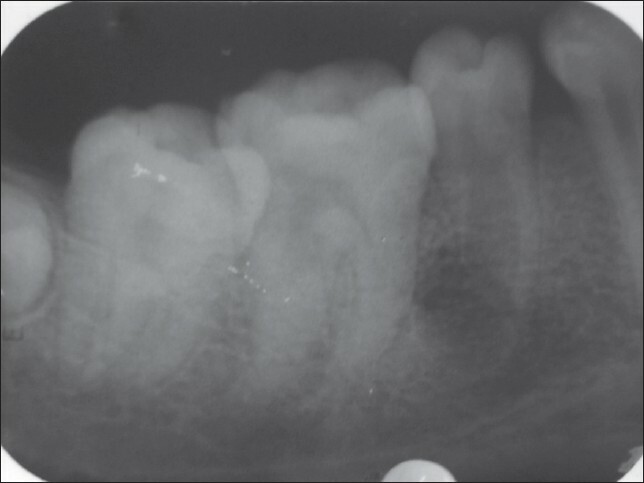 In the first case, the patient reported with intraoral sinus and pus discharge related to tooth #45. On radiograph, open apex (blunderbuss) was found along with periapical radiolucency. In the second case, the patient reported with pain and swelling related to tooth #26, having large periapical radiolucency related to the palatal canal. On vitality test, both the teeth responded negative, i.e., non-vital. Conventional RCT was planned in both the cases with orthograde MTA- Angelus (Angelus, Londrina, PR, Brazil) apical plug followed by the proper obturation with gutta-percha (G.P. ), and after that the patients were kept on periodic follow-up and the outcome-based clinical and radiographic criteria were assessed. The post-obturation assessment at 1-month interval showed changes in the size of radiolucency with a gradual decrease, and after 6 months a remarkable decrease of radiolucency or the defect was almost filled with bone formation visible around the roots.